English Major/ Future English teacher. And before you ask, yes I am weird like every other great English teacher! I hoard books and kind of having a book buying problem. I will review books when I get the chance to read them and occasionally talk about my readings that I have in class. 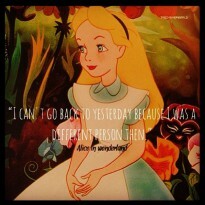 So please follow me down the Rabbit Hole. And remember, We Are All Mad Here.